We all need pianos from time to time and it’s often helpful to have a sizeable arsenal to call upon, so that you don’t find yourself returning to the exact same sonic imprint time after time. This is where UVI’s new collection of acoustic keyboards could come in very handy, along with a helpful smattering of other keyboard curios. 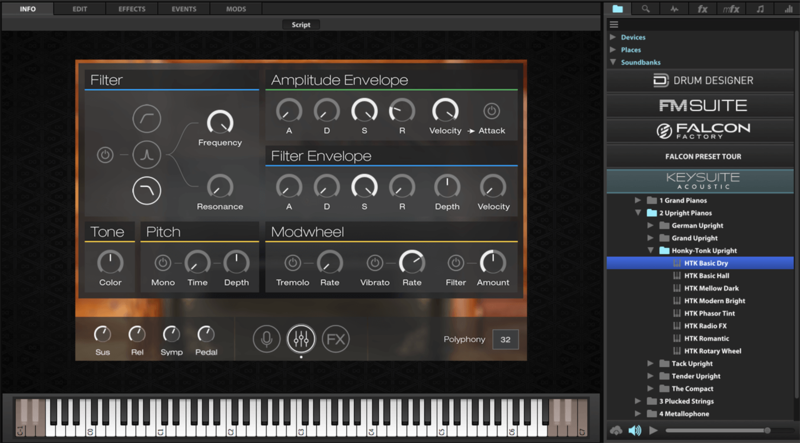 This package fits into the established UVI eco-system, allowing users to load directly into the Falcon soft synth, or use within its free Workstation player. In either case, the playback functionality remains the same, with the Workstation environment offering a particularly uncluttered visual. It’s very easy to be drawn straight to the first category of pianos, offering five different flavours of grand. These vary from the classic Steinway Model D and Yamaha C7, through to the beautiful Fazioli F278. They are all classics in their own right, with user selection largely dictated by the choice of placement within a track. Experience tells me that the Steinway always sounds stunning in a more soloist capacity, and certainly there are no complaints on that front. There is a beautiful depth to this sample, particularly in the lower register, where it sounds earthy and sonorous, while the Yamaha C7 sample sounds bright and crisp. This pairing of pianos alone could be considered enough to cover most pianistic eventualities, but the patching unravels with a healthy smattering of settings for each. There are eight preset patches for each piano, with uniform characteristics throughout, but all largely relying on the FX bussing. Apart from more common dry and reverberant patches, other presets such as the Radio FX patch modulate the tuning, with a nod toward the phasing of an AM radio. Delving deeper reveals a healthy barrage of effects on the FX page, with a useful contingent of reverbs, delay and modulation devices. There’s even the inclusion of an impulse-response element, although I do find the chosen setting on this effect curiously difficult to read; it’s almost as though UVI has engineered it to mimic a hardware unit where the display is failing! Authentic touch, possibly, but I keep squinting to see what it’s doing, until I click on the menu, where I’m treated to a more stark and readable drop-down. Each grand has its own distinct character, with the Fazioli being another informed highlight, while the Hybrid piano is akin to Frankenstein’s monster in pianistic form! Comprised of components from Steinway, Yamaha and Bösendorfer, the Hybrid results in a crisp and bright timbre which can be coloured further through additional microphones, which can be faded in and out at will. 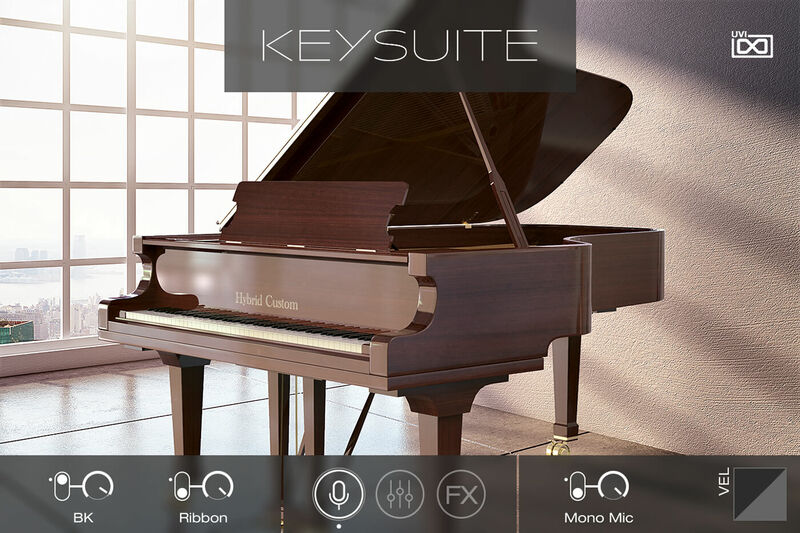 This highlights a slight bugbear, as the Hybrid Grand is the only grand piano which offers additional mic signals, which I find to be unbelievably helpful. The general Hybrid colour is fairly bright, presumably from the Yamaha quotient, so the ability to dial in the ribbon-mic signal darkens the overall colour beautifully and naturally, and makes me wish I had this component available throughout the library. Moving on to the next category and we have an extensive collection of uprights, with six very different offerings. At the more usual end of the spectrum, the German upright (Seiler), and the Grand Upright (Steinway), are both beautifully sonorous, being darker than their grand counterparts, and more generic. The Grand Upright offers the user the helpful additional mic’ing, with the ribbon adding a fair degree of mid-register body to the signal. What I like about these uprights is that they sound exactly as they should do, but the higher register does sometimes feel a little percussive, particularly with the employment of the ribbon mic on the Upright Grand instrument. The note and pedal release elements become sharpened on the uprights, with stunning attention to detail as the strings ring on slightly under dampening. There’s also the inclusion of a very staccato tack piano and honky tonk piano, the latter of which sounds beautifully otherworldly. It feels modulated, which of course it is, but under tuning. With the release of each note here, all sorts of discordant tunings emanate, making it immediately appealing if you fancy exploring this library outside of the pianistic norm, and this concept can be taken further with the inclusion of a healthy contingent of editing parameters. Filters and envelopes are available on each piano, meaning that in the most basic setting, it would be very easy to dull a piano with a low-pass filter, if it helped at the mix end of business. I’m aware of some of the pianos performing better than others with regard to velocity zoning and layering. The Steinway Model D Grand was a notable example, where the exaggerated hammer at the upper velocity end seemed to become exaggerated fairly quickly. It’s important to stress that while this library is very piano-centric, there are some excellent further keyboard inclusions, beginning with the next section of plucked string instruments. Here, there are a couple of harpsichords which sound simply stunning – if you need this sort of thing on a regular basis, they could prove most useful. 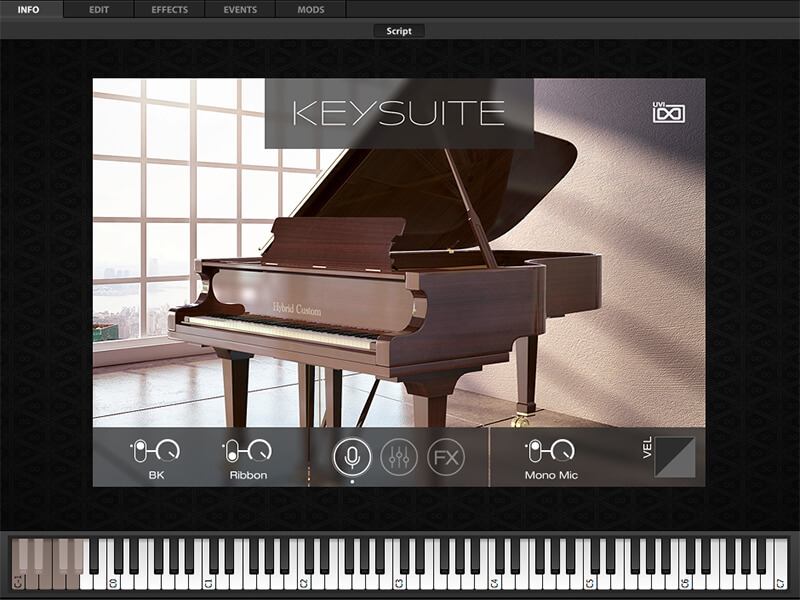 They also operate nicely with the sustain pedal, which would not always be the case with samples of this kind. So rich is the harpsichord sample that I find myself immediately reaching for the EQ, as there is a healthy and completely realistic thump every time a note is released. In fact, the harpsichord is not open to the same degree of synth-like editing available to the pianos, but it is does allow for control of the timbal element. There is also the inclusion of a spinet and clavichord within this section, both of which are fairly rare. They are colourful and usable, but of course it does depend on what you feel you are in need of. You’ll also find a Metallophone section, which is bristling with celestes, dulcitones and even a keyboard glockenspiel. These are all highly usable and not surprisingly very bright, so you’ll probably want to use them sparingly. But in line with the library’s ethos, there’s plenty of sonic contrast available for all eventualities. 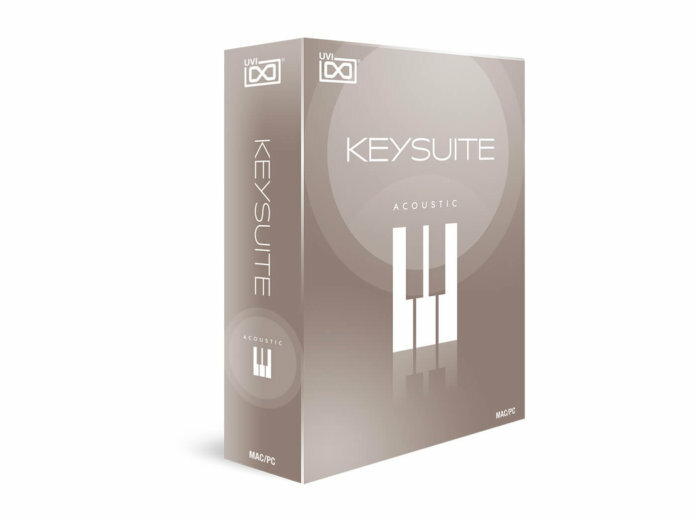 As with all other UVI libraries, this is an impressively comprehensive and capable soundset, which offers a multitude of timbral colour and control. The quality of the source material on offer is very good, with occasional moments where a couple of the pianos lack extensive dynamic layering, but given what you get for the package price, I don’t imagine too many will find this an issue. It’s another stunning collection to add to an already brimming UVI library. If you regularly need pianos, (and let’s face it, we all do from time to time!) you’ll find the comprehensive nature of what is on offer here very appealing. The texture and sonority of these samples is really excellent, with plenty of control where you need it, even without the availability of the additional mics on some of the models. 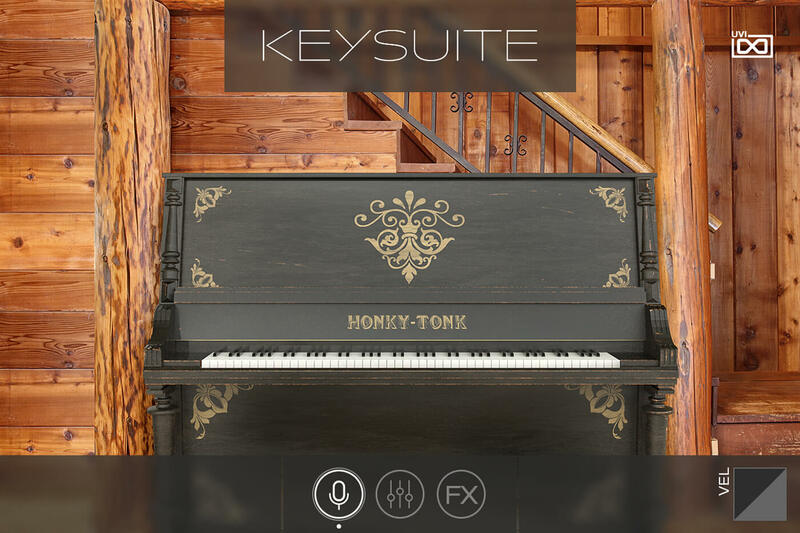 The ability to edit these samples through elements such as filtering, means that it’s possible to create pseudo felt-like piano textures, while the FX section is suitably comprehensive. The addition of the included unique acoustic keyboard instruments means that you can also have clavinets and harpsichords on hand, should you ever feel the need to employ them. Given the price point for this package, and if you are already in the UVI ecosphere, it represents very good value for money. 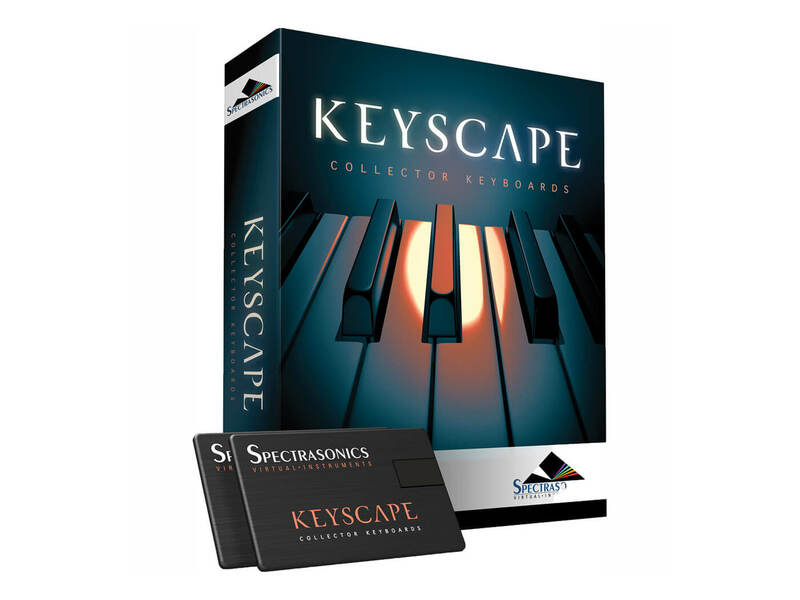 With one of the largest collections of keyboard instruments, Keyscape offers pianos, electric pianos, clavinets and loads more. It’s unbelievably comprehensive thanks to the more recent ‘creative’ element, which will fit perfectly for anyone who already owns Omnisphere 2.5+. A very classy act! 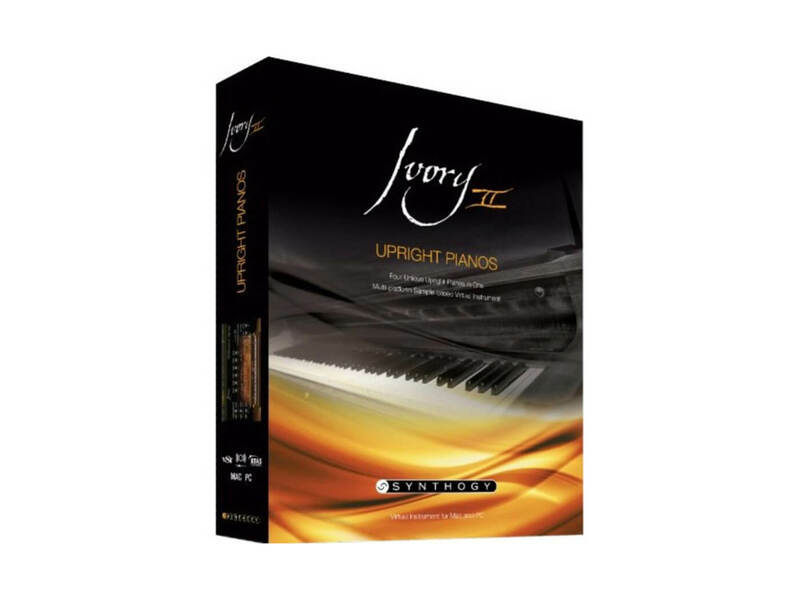 For many, Ivory and it’s successor Ivory 2 represent the first of the packages that bought piano samples into the modern technical era, with four exceptional grand pianos which have been comprehensively sampled from all angles. It can almost sound too good for certain mix situations, but still cuts the mustard. It’s so useful to have a sizeable collection of pianos and rarer keyboard instruments, all of which offer unique colour and character.